Tip for travelers to Bangkok. While anything -- and I mean absolutely ANYTHING -- seems acceptable in this town, the one thing that is not acceptable is entering a temple or a palace in shorts and a tee - men or women. Funny how that little rule has given rise to a convenient marketplace outside every temple and palace. Before we could begin our day, we first had to join the throngs of tourists purchasing "acceptable" clothing at one of these markets. I chose a light-weight, thin pair of elephant-print wrap pants and cute white blouse to go with it. 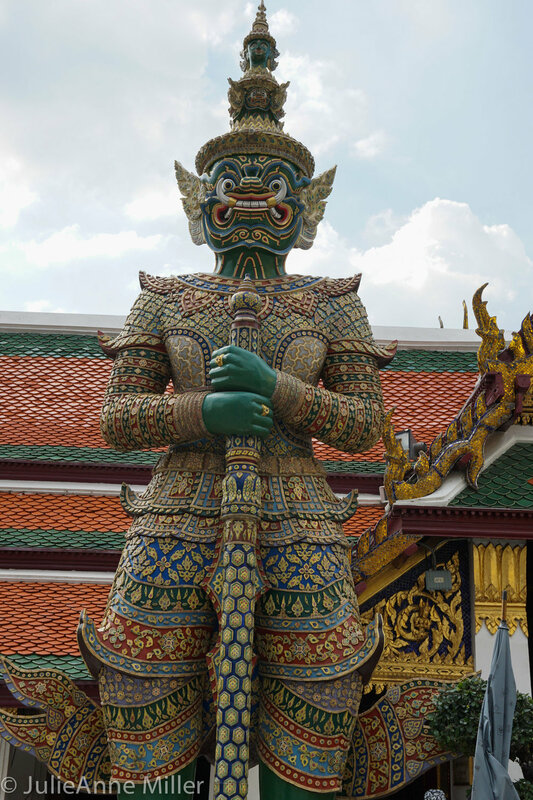 Women have to be covered to their ankles with no shoulders bared; it seems men can get away with traditional Thai baggy pants that hit at about the calf. 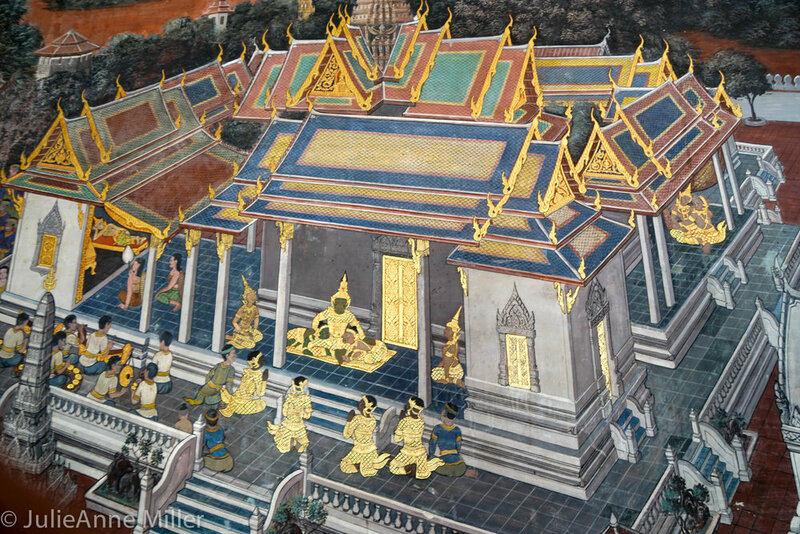 The Grand Palace is a complex maze of religious and governmental buildings. 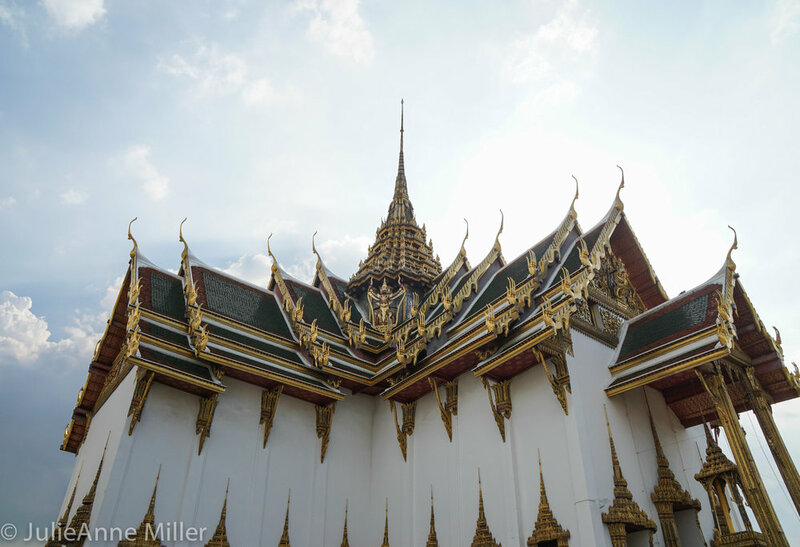 In one building, visitors queue in reverent silence to enter the temple of the emerald buddha. In another building, tourists jostle for photos of the king's throne and amble past various displays of weaponry through the years. 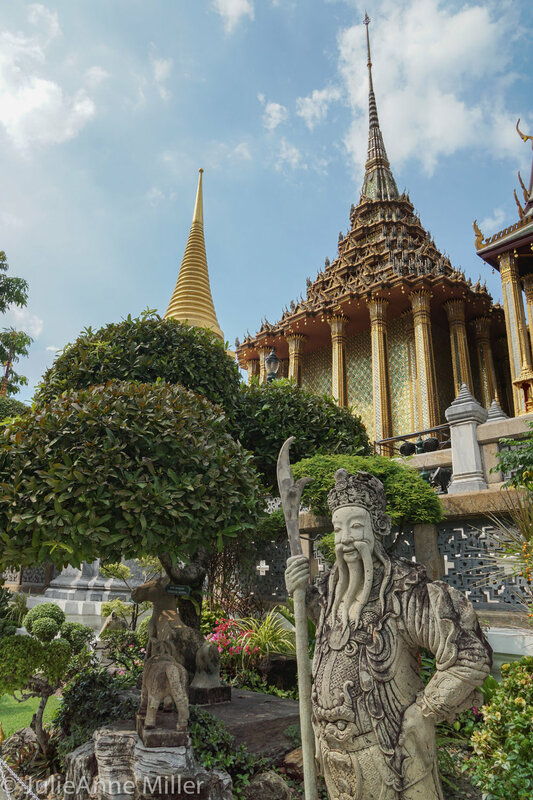 There are colorful gardens trimmed to perfection and a mish-mash of architectural styles. Golden spires shimmer in the hot tropical sun mingled with brilliant blues, reds, and greens. 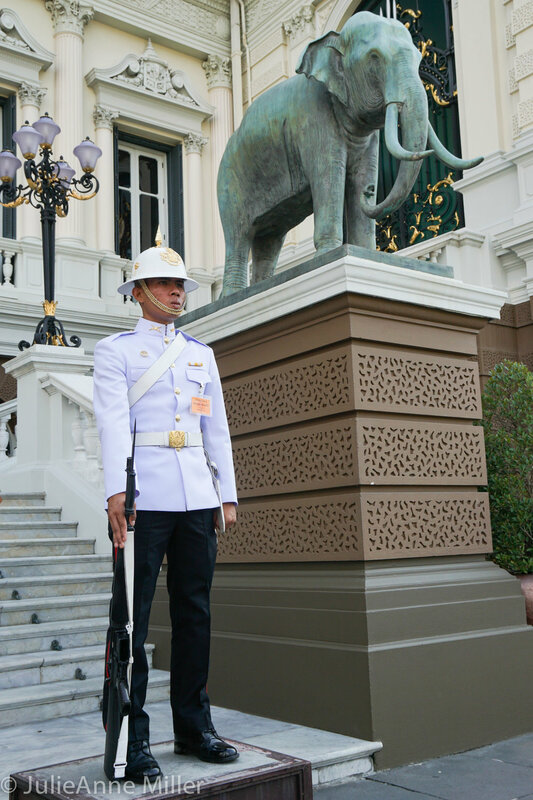 To sum it up: the Grand Palace is a delightful experience! Just don't expect to make much sense of it all! 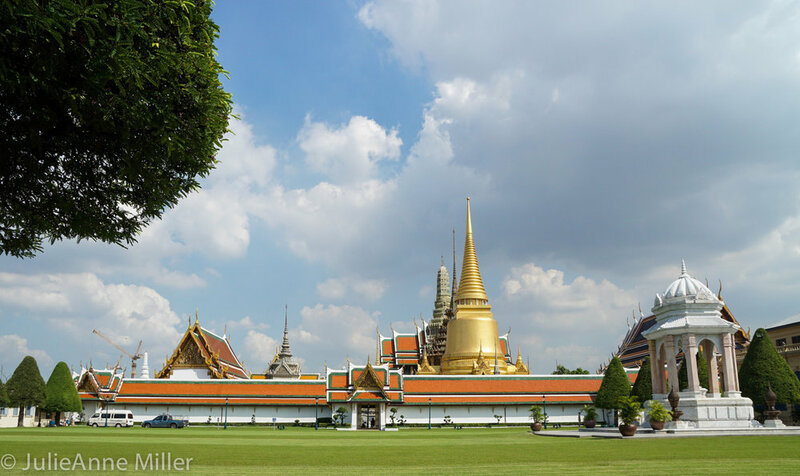 Wat Pho is the home of the gigantic reclining golden Buddha! It was much calmer and quieter than the Golden Palace. We traveled there by tuk-tuk and I definitely fell in love with this fun mode of transport! While here, I made a wish 100 times with 100 pennies. I can state with 100% confidence that my wish came true. 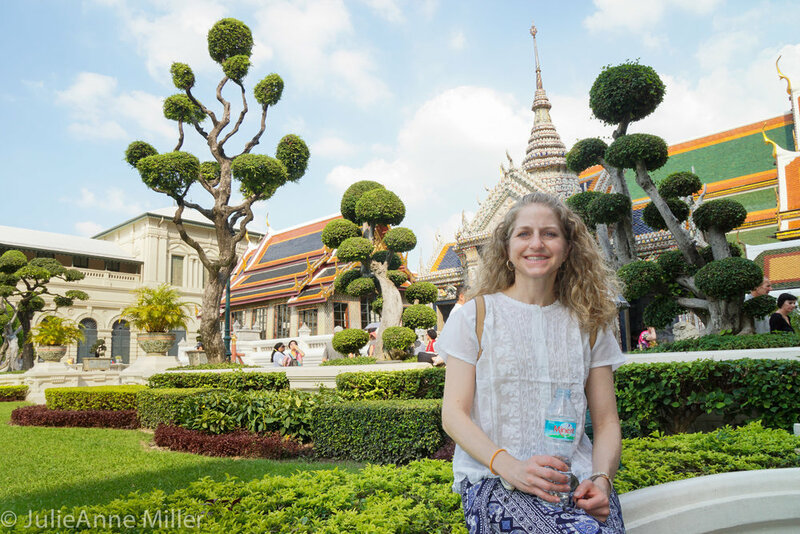 By the time we left Wat Pho, we were soaked with sweat and ready for a shower. This is a normal feeling in Bangkok - the need to shower. 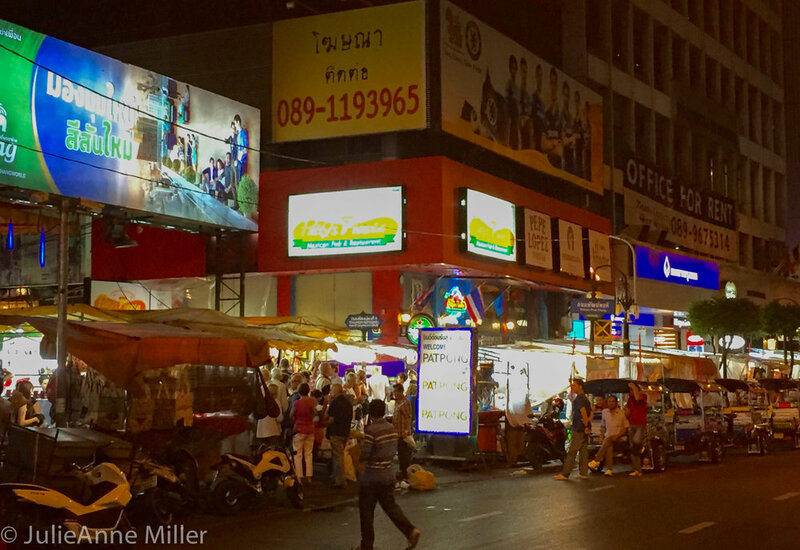 Wild, wonderful Pat Pong is a haggler's dream and a tourist's money sink. Do not buy anything the first night. Try to get some sense of market prices before you start haggling with the street vendors. If you go to Asiatique, where everything has price tags and there is no haggling, you will learn what the price "should" be. Then you can bargain down 10-25% from there with the street vendors.